Ahhhhh…. 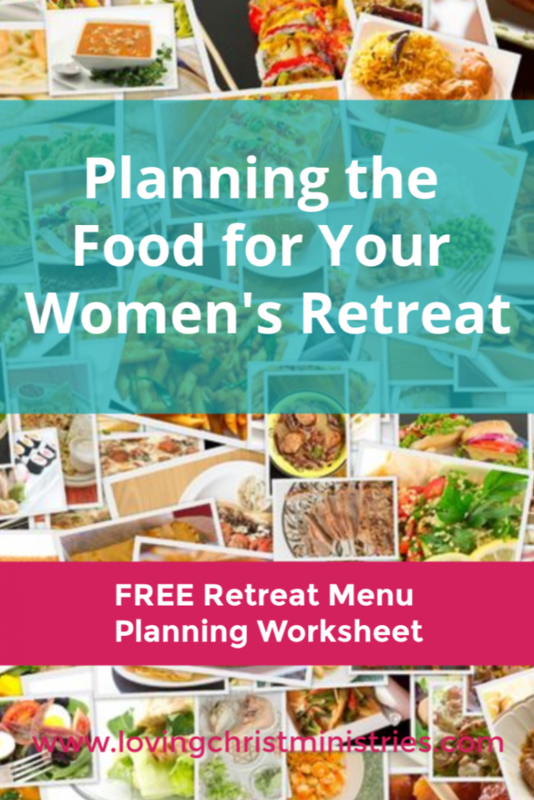 planning food for your women’s retreat. This is one of my favorite parts of the entire planning process. What does it say about me that one of the first things I think about when heading for a retreat or even bible study is, “I hope they have good food.”? A retreat nourishes my soul and provides comfort in many ways. Having my body nourished makes me feel that much more cared for. That’s why I always make sure to overplan food. 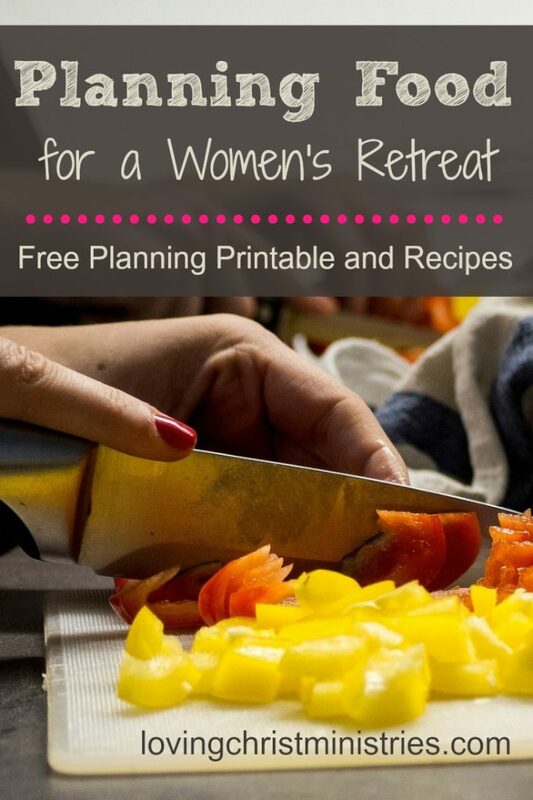 If you’re planning a women’s retreat, one of the first things to consider when planning food would have to be the length of the retreat and what meals you’ll serve. For a one day retreat, you might simply want muffins, fruit, coffee, juice in the morning and a simple lunch. Brooke and I spoke at a one day retreat in St. Louis once where they took our orders for KFC beforehand and brought in boxed lunches for everyone. Super easy, plus yum! We’ve also been served hot buffet at a retreat held in a hotel convention center and soup and sub sandwiches with all the fixings in fellowship halls. It all comes down to location, facilities, timeframe, and budget. At some retreats including the ones we hold, a cook and hot meals are provided. If you rent a large facility, you can often pay to have the staff cook prepare meals and clean up. Depending on budget, this is a great option for the least amount of stress. However, it’s possible to still prepare hearty hot meals when the budget doesn’t allow for hiring a cook. At our weekend, overnight, and full day retreats, we ‘hire’ a lady to be head cook. This is a win-win for both of us. She pays for her retreat by being our cook and then participates in all of the rest of the activities, praise, and worship. It helps her attend when she otherwise might not be able to, and it helps us keep our costs down. Remember, though, if you do this, even the best of cooks can get overwhelmed in an industrial kitchen cooking for 40-100 people. Make sure she has plenty of help! We’ve provided kitchen support and help in several ways for our cook. 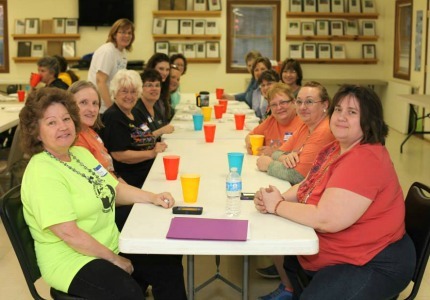 We’ve had set teams of ladies provide prep and clean-up help for a discounted retreat rate. My husband, who’s an excellent cook (way better than me), and my daughter have been ‘on staff’ and worked in the kitchen to prep and clean. We’ve even had huge sign up sheets on those giant sized Post-it Notes where attendees had the option to sign up to help with prep or clean-up for one of the meals. I wasn’t sure how that would go over, but we never had a blank space that someone didn’t cover. The main thing to remember is to make sure your cook has plenty of help or else she’ll never have time to attend another portion of the retreat. The food/kitchen can be the most time consuming of a large event and can become overwhelming if not planned to the T.
For drinks, we always provide iced tea, lemonade, and water with each meal. At breakfast, we serve orange juice and apple juice, too. Because we have a coffee bar at our retreats, the ladies typically go there for their hot drinks including hot chocolate and hot tea. We also provide other foods and drinks throughout the day(s) of our retreats. The coffee bar stays open throughout most of the day, and the tea and lemonade dispensers are kept full and available. At the coffee bar, we provide a selection of cookies and breads which make for nice snacks. Each table in our main gathering area has a mix of hard candy, chocolate, and gum. We don’t provide soda, but we typically have 20 oz bottles for sale for those who want. As you plan food, it’s important to keep in mind different dietary needs. It’s impossible to meet everyone’s needs all the time, but we always ensure we have a variety of options for vegetarians and for those who are gluten-free. At lunch and dinner, we provide a stocked salad bar with loads of veggies plus hard boiled eggs and grilled chicken. We also make sure that when we use spices or sauces we choose brands that are gluten-free. This helps take care of most of the needs of those with dietary restrictions. However, make sure you let the ladies know ahead of time what foods will be provided (at least in general), so they’ll know if they need to bring anything of their own. 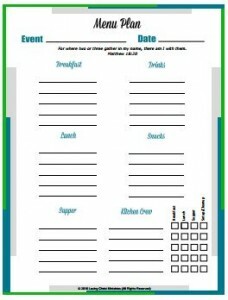 I use a simple planning list to get an idea of what to serve, who will be serving, and how much help will be needed. Print your own. It’s free! To get your free printable, simply request the Resource Library password in the form below. You’ll get the password immediately on screen, plus the password will be emailed to you. Want to remember this? 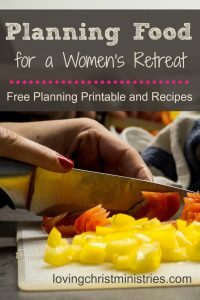 Post Planning Food for a Women’s Retreat to your favorite Pinterest board! Subscribe to the newsletter for regular retreat planning tips plus get these handy lists for your women's retreat icebreakers! Woohoo! Check your email to get your icebreakers printable! Your retreat is gonna be so much fun! Great post! I love your humor! Food IS important! 🙂 I love your website. It’s beautiful! Great tips! I’ve only ever helped plan one retreat, and at that one, a gentleman from the church offered to handle all the catering. He did a FANTASTIC job! That’s wonderful! We may have to give him a call next time! Thanks so much! I hope you find something you can use. I’m in the process of adding more, so be sure and check back, too.